When John Brandi moved to New Mexico in 1971, he designed and built a small cottage near Guadalupita, north of Mora. Opposed to the Vietnam War, he had served as a Peace Corps volunteer in Ecuador and begun publishing poetry as part of what he calls South America's "mimeo revolution." Using a Rotary Neostyle hand-operated mimeograph machine, he founded Tooth of Time Press in his cabin and thus brought the revolution north. 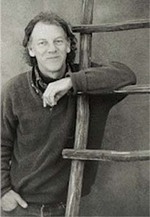 Brandi published the work of other writers in addition to his own, and his press became known for attractive books of poetry. From the beginning, he combined writing poetry with making art. Currently a resident of Rio Arriba County, Brandi is the author of more than three dozen poetry collections. He has also created many works in a format called broadside -- poems printed with artwork on large sheets of paper and designed for display. Born in California, Brandi began his creative endeavors early. "My parents encouraged me to draw and to write at a young age," he said. "My dad was an accountant for a newspaper in Los Angeles. At the end of the month, he would ask the pressmen to cut end rolls into 8-by-10 sheets for me. He gave me a coffee table to work on and said, 'Draw the places you've gone with your mother and me.' My mother would always add something like, 'Write about how you felt when you were standing on those rocks with all those waves crashing around you.'" Read more about John Brandi. 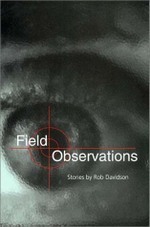 Robert Davidson got his doctorate in American Literature in 2002 from Purdue University. Before that, he and his wife were in the Peace Corps, from 1990 to 1992. He joined because of Linda, who had more of an idealistic "do-good-in-the-world" mind-set. "I wanted to travel," he said. "My intentions weren't as noble." The couple spent two years in Grenada, a Caribbean island. While there, he taught students about reading and writing, but found there wasn't much to do in his spare time except read and write. He hadn't always wanted to be a writer--"It whetted my appetite, I guess." There, Davidson learned discipline. He would wake up at 5 a.m. and write for two or three hours almost every day before work. "At first, that sucked," he said, the experience still fresh in his mind 16 years later. "Then I realized I had to do it. I liked doing this every day." Davidson's Peace Corps experience changed how he wrote about people. He said he learned to "see with a new set of eyes." Having to live in the 13-square-mile country for two years made him adapt to their way of life, instead of them adapting to his. "I recognized I had biases, preconceptions I didn't know I had," he said. "It was really hard to let go of that." Read more about John Davidson. For years, the grisly murder of a female Peace Corps volunteer in 1976 haunted Jan Worth of Flint, who served with the organization in Tonga in the South Pacific archipelago at the time. Worth came to grips with the tragedy by writing a novel loosely based on the real-life events. The task took more than a decade. Though she made up the characters in the novel, the main events are true, said Worth, who was 26 at the time of the murder. "I never wanted to tell a factual story. I wanted to be able to embroider it." Peace Corps volunteer Dennis Priven confessed to the murder and was found not guilty by reason of insanity. He returned to America a free man, where he worked in a government job for years. Another outcome from the experience occurred when she married Ted Nelson, a man she'd known in Tonga, in July 2005. (She'd been divorced after 15 years of marriage.) Worth and Nelson reconnected through Philip Weiss, who had interviewed both of them for his book, "American Taboo." They e-mailed for months, spoke on the phone and eventually met in Flint. He lives part time in San Pedro, Calif., where he runs a trophy business. "Twenty-five years later, we got together," she said. "It clicked. That'll be the second novel." Read more about Jan Worth.